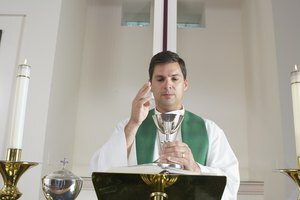 Do Presbyterians Take Holy Communion? First Communion for children is both a solemn and festive occasion. 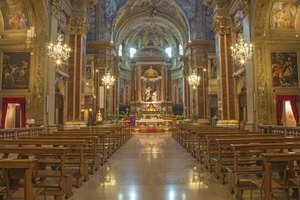 Christian churches celebrate rituals and declarations of faith that are both symbolic and dynamic. In Protestant and Catholic churches, the Eucharist, or Communion, is a profession of belief in Christ and his teachings and an occasion for receiving divine grace. First Communion is the sacrament that welcomes converts and children to the feast of the Eucharist, the gift of Christ's life to redeem sinners. The first Eucharist, according to Christians, took place at the final meal Jesus shared with his closest disciples. At this feast, Christ broke bread and poured wine, which he offered to everyone, urging them to remember him and regard the bread and wine as his own body and blood. The meal was the precursor to his betrayal, torture and death by crucifixion, a sacrifice that Christians believe he made to redeem humankind from original sin and hold out the promise of eternal life in heaven after death. Christians repeat the symbolic offering in their regular services, according to the individual beliefs of each faith. First Communion, in both Catholic and Protestant churches, celebrates the beginning of participation in a powerful sacrament and devotional practice. A first communion is a joyous and hallowed occasion as the baptized Christian is welcomed into the congregation of communicants and takes the consecrated bread, or bread and wine, for the first time. It is an initiation commonly given to a child at age six or seven, after a suitable period of basic religious instruction and demonstrated understanding of the principal beliefs of the faith. For children, it is traditional to wear all-white clothing, signifying purity. In Catholic churches, a child carries a rosary and a small prayer book blessed for the occasion. 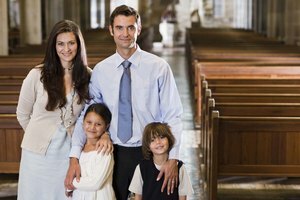 First communicants usually attend a special service or Mass, with their catechism group and their family, where they receive the sacrament for the first time. Older converts receive First Communion at the discretion of their religious instructor. Catholics embrace the doctrine of transubstantiation. They believe that an ordained priest has the power to turn the unleavened host and chalice of wine into the actual body and blood of Jesus Christ. Participation in the Mass and partaking of the Eucharist confers divine grace on a baptized Catholic who is reminded of the sacrifice of Christ’s death and resurrection in atonement for the sins of mankind. First Communion initiates a child or a new convert into this lifelong and repeated affirmation of faith and reception of grace. 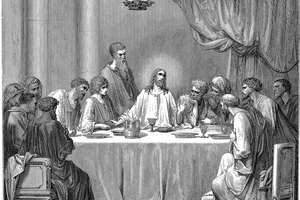 Protestant denominations also hold that the communion ritual signifies the sacrifice of Christ and is a reminder of the "Last Supper" in which he charged his apostles to remember him and spread his teachings. But Protestants do not share the belief that the bread and wine become the actual body and blood of Christ, and there is no requirement that an ordained member of the clergy – male or female – perform the blessing over the bread and wine and distribute them to the congregation. Presbyterians and Episcopalians, for example, teach that the sacrament provides spiritual nourishment. A First Communion is the opportunity for the primary declaration of faith in Christian beliefs that will be repeated every time the communicant participates in the symbolic rite. Most Catholic churches distribute the Eucharist in the form of individual unleavened wafers. The wine used in the chalice is consumed by the celebrant of the Mass but is usually not shared with the congregation. Roman Catholic churches were given the option to distribute consecrated bread and wine by a Vatican decree in the 1960s but this is still not a common practice. Protestant churches use bread – leavened or unleavened – and a grape-based libation for their Communion service. Communicants may receive both bread and wine from the celebrant of the service, go up to the altar to take bread, or pass it throughout the congregation. Wine or grape liquid is distributed in individual cups or drunk from a single, shared chalice that is passed around or kept at the front of the church. Protestant churches also offer bread dipped in the blessed wine, an act known as intinction. Oblates USA: Why Do We Celebrate First Holy Communion? Evangelical Lutheran Church in America: At What Age Do ELCA Congregations Allow Members Their First Communion? Do Episcopalians Believe in Open Communion? Crawford, Benna. "Christianity & First Communion." Synonym, https://classroom.synonym.com/christianity-first-communion-12086136.html. 29 September 2017.